Start your contact center in 5 minutes. Improve support with Screenpop and Click to Call. Automatically tag calls to tickets. Cloudagent unified desktop gives agent single window access to all contact center applications such as multiple-channels, dialers and more. Cloudagent, with it's advanced features like screen pop, ACD, skill routing, sticky agents, agent scripts etc has been proven to improve the contact center agent efficiency by 60%. Interaction Analyst in Cloudagent is an advanced business intelligence tool which helps you get insights into your contact patterns. It offers more than 300 reports across all dimensions of a contact center. It can help you answer questions like "Who is the most efficient agent? ", "What is the average call handling time for support skill? ", "What is the peak hour for my call center?" Customers contact your contact center to get answers. 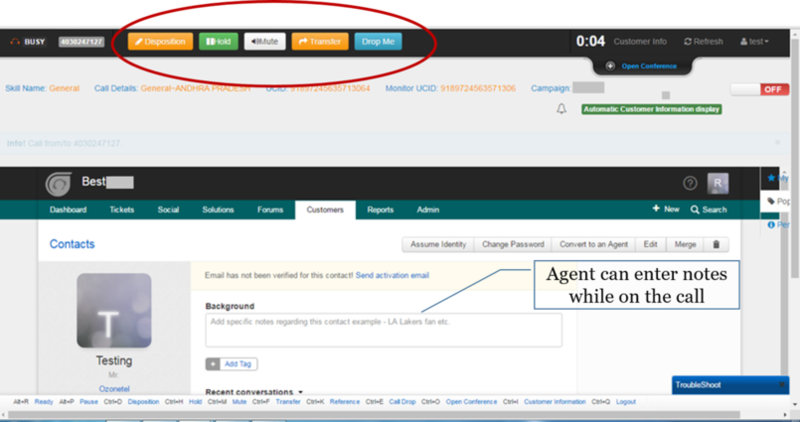 Cloudagent, with Cloud IVR you can design complex IVRs integrated with your back-ends to answer caller queries before they reach your agents. Agents have access to contextual information about the caller including previous contact history. Cloudagent integrated voice logger allows supervisor to judge agent performance in context of the contact i.e. campaign, skill etc. Cloudagent allows to custom define the different weightage parameter applicable to particular skill/process allowing agent performance to be judged in terms of parameter that impact the process performance the most. Integrate easily with Fresdesk. Greet callers with status of their ticket. Sign up at http://cloudgaent.io for international or http://cloudagent.in for India. Share your Freshdesk instance URL to support@cloudagent.in. We will configure your Cloudagent and you will be ready to go.